Today, August 1, 2014 is the opening ceremony of the Cinemalaya Independent Film Festival at the Cultural Center of the Philippines. A full house CCP Main Theater as CCP Vice President and Artistic Director @chrismillado (on instagram) just opened the program and announced this year's new components such as the Cinemalaya X Lounge, Cinemalaya Book and the Cinemalaya Indie Circle (membership), followed by Cinemalaya Foundation Inc. President @nojardin (on instagram) who gave an impressive report on the Festival. 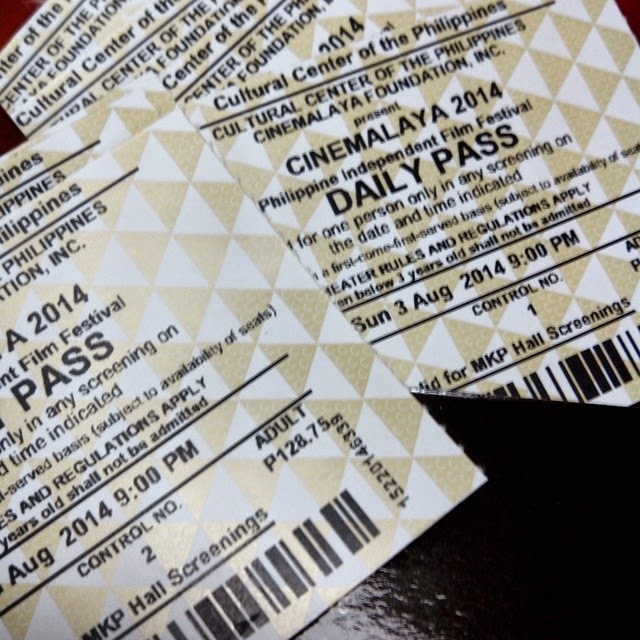 Our Cinemalaya 2014 (Year 10) Daily Passes. Our 2nd year of Sunday "Tambay" at CCP. Again, like last year - we got the first (and second) set of tickets printed for daily pass. Meet the stars and production team on these dates. Get your GALA NIGHTS tickets now! and TOTAL RUNNING TIME est. The Janitor R 13 112 mins.